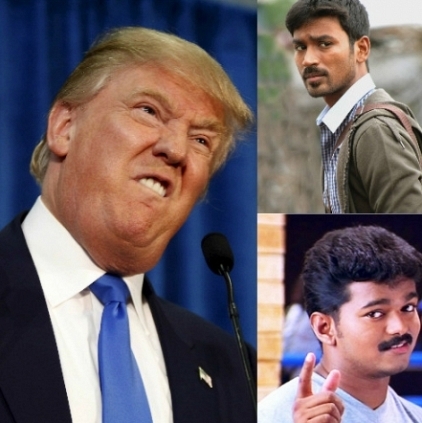 HOW IS TRUMP AFFECTING VIJAY AND DHANUSH? American President Donald trump’s announcement on the immigration ban of seven Muslim-majority countries to enter into the USA for the next 90 days had received widespread flak from all over. Looks like it will have a far-reaching effect. As regards our Tamil film industry, there are a few films which had planned their shooting schedule in the USA. One was Vijay 61 and we had reported that the unit has changed its plans to shoot in America and instead will be proceeding to the UK. On the other hand, director Karthik Subbaraj’s film with Dhanush was also planned to be shot in America. We are not sure, whether there would be a change in this, after Trump’s announcement. There is a general belief that if there are Muslims in the unit, it may be difficult to get a visa to America now. There is also Kamal Haasan’s Sabash Naidu which had completed a schedule in the USA. We don’t know if they have some more portions to be shot in there. With Trump’s tough immigration policies, we need to see how things pan out especially for the film industry that had planned to shoot in the Land of Opportunities! Did Karthika Nair replace Samantha in Vijay 61? People looking for online information on Dhanush, Donald Trump, Immigration policy, Vijay 61 will find this news story useful.